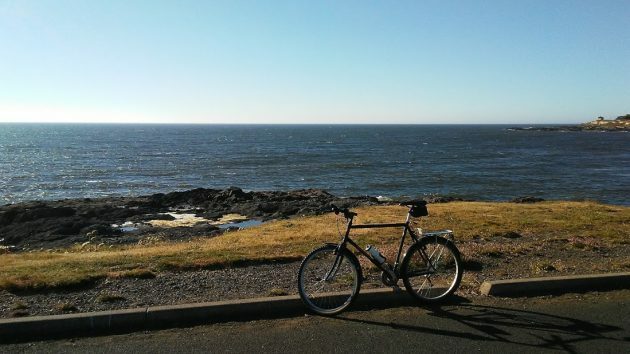 Balanced at a curb with an ocean view, the bike stands up even in a cool evening breeze. One hears a lot about this heat wave coming our way. The forecasters are warning of triple-digit temperatures. The warnings don’t help unless you can get away. Willamette Valley residents who don’t have to be at work have a way to escape. If our houses lack air conditioning or the AC breaks, we can head west, and in about an hour the valley’s heat is but an unpleasant memory. What a true story that is. Maybe after next week’s heat fall will be here. HH assumes that if it is 100 deg plus in the Willy valley it is the same in the fly over “red states” country. Well as luck would have it, I too, have said interwebs. Omaha, NE will be a sunny 88 of a high on Wednesday. For most of Kentucky, it appears to be 87 on Wednesday. 89 high for most of Arkansas, so you see we can all escape to dah “red states” if we want. This all brings me to remind y’all that daytime temps do not equate to climate change. The latter brings the true challenge. What happens when the ice caps introduce long sealed pathogens? A wake up call !